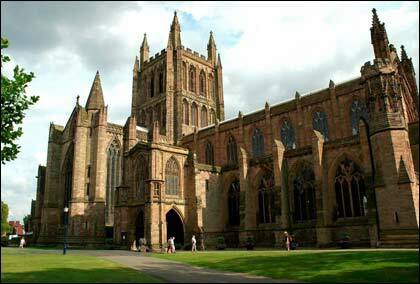 there were only two grammar schools for boys, not counting the highly specialised Cathedral Choir School – Hereford High School and Kington Grammar (There were also grammar schools for girls). Both were geographically isolated from our home in the hills above the Golden Valley in the south west of the county. This presented my mother with a dilemma: daily travel to Hereford would involve a 2½ mile walk to the nearest bus stop and the same in reverse. Alternatively she would have to find a family in Hereford with whom I could lodge Monday through Thursday. Uniforms were another problem for someone subsisting on a war widow’s pension. Her search for alternatives took her to Reed’s School, a boarding establishment in Surrey. Originally founded in 1813 by Andrew Reed the school had begun if as an orphanage in the East End of London and may well have been the inspiration for Charles Dickens’ ‘Dootheboys Hall’. By the 1950s it had re-located to Surrey and offered a grammar school education to boys who had lost at least one parent. In the 1950s that meant that most of its pupils were, like me, the sons of men killed in World War Two. There were approximately 150 of us, aged 11-16, with a small sixth form. It is important to remember that back then less than 10% of young people went to university1; there simply were not enough places. Boys and girls wishing to enter the professions often learned ‘on the job’, continuing their formal education via ‘day release’ – an agreement with their employer to allow them one day off each week to attend college to study for an appropriate qualification. They might also attend evening classes. In the 1950s, Oxford and Cambridge and a handful of others were the only third level options available in the UK. Even among the select few who attended grammar schools, most left at 16 having taken the General Certificate of Education (GCE) at ‘Ordinary’ level. Only a handful continued on in the sixth form for the two years it took to study to Advanced level standard, the minimum requirement for university entrance. In my school the available subjects for study was quite narrow. This was a feature of the small size of school. It was neither practical nor possible to employ sufficient teachers to cover a wide range of subjects. I and most of my cohort took only 8 subjects at ‘O’ level from a possible choice of 10. Jump forward 30 years to the second half of the 1980s and I am a County Councillor in an area with a population in excess of 800,000, responsible for a large number of schools and colleges. In four years I met many teachers and education administrators, as well as other local politicians, the majority of whom were opposed to selection. During that period the Council embarked on the re-organisation of the schools in one of the urban centres in the county, a process that led to a great deal of debate and discussion centred on the importance of school size in order to achieve a satisfactory range of educational experiences for the pupils. There was, as well, a lot of debate about the importance of providing the opportunity for every pupil to develop his or her full potential. There was then, and there remains, a broad consensus that the comprehensive system is better able to meet both criteria than is a system in which the most academically gifted pupils and teachers are segregated from the rest. In the 1950s the cleverest pupils – the ones that went on to university – had a very limited range of options available to them. A narrow curriculum at secondary school was not seen as a disadvantage. Given the diverse range of careers available to graduates today, and the equally vast array of third level courses in universities, it does seem to me essential that schools are able to offer a broad range of subjects capable of developing an equally wide range of skills among their pupils. The best comprehensive schools do just that. Meanwhile Reed’s School has become a fairly exclusive private school that still maintains around 60 places for ‘Fundationers’, children from single parent and similarly disadvantaged households. The fees paid by the 600 or so private pupils, most of whom are day boys and girls from the immediate neighbourhood, help to fund the education offered to foundationers who are enabled to enjoy a broad curriculum with some specialisation. The tennis training it provides was made famous by Tim Henman. The school also offers excellent tuition in music and in Design and Technology. As an ex-pupil I am pleased to see my old school go from strength to strength but I have serious reservations abut its exclusivity. By franklparker in General posts on September 12, 2016 . Interesting, Frank. As a British colony until our independence in May 1966, our country also followed the same British education system. Our 11+ examinations for entrance to grammar school were known as the Common Entrance Examination. At our grammar schools, known as high or secondary schools, we also took the Oxford & Cambridge and later the London (deemed less difficult) General Certificate of Education (GCE) at ‘Ordinary’ level. As I did well at the ‘O’ levels, I stayed on another two years to do the ‘Advance’ level. I studied geography, art, and mathematics. I later went on the University of Guyana to major in geography. By the time I attended a grammar school in 1969, the 11+ exam had gone and all I had was a half hour interview with the headmaster. We discussed which book I was reading. I stayed there for 2 years before leaving due to a house move, but then found a comprehensive education suited me better as I was arty, liked creative writing, and was musical. However, I am still of the opinion that bright children from poorer households should be given a chance to shine at grammar schools. Only one girl from my comprehensive of 2000 girls went to Oxford in my time there. The top posts in this country are more often than not taken up by people who once attended private schools, and were fortunate enough to have the advantage of tapping in to the ‘Old Boy’ network. Grammar schools need to be reinstated so that bright pupils are not held back by some disinterested and distracting pupils unwilling to learn, who spoil it for the rest. In an environment of similarly-minded children they can study hard and have their chance to move up the corporate ladder. Future generations need for example research scientists, specialist doctors, and gifted teachers. My hope is that one day if a grammar school pupil can see the top of the ladder in sight, they might not find someone already there from a private school who has not passed them on the ascent. Your final sentence applies to Mrs May! I am sure that is why she is promoting the idea of grammar schools. I have one question in regard to this: why stop at specialist schools for academically able pupils? It’s worth remembering that the post-war education bill that created the state grammar schools also included an ambition to create technical schools. That, unfortunately, fell by the wayside. We do have specialist schools for the performing arts. On the broader point, I had a friend back in the 1980s who was convinced the compulsory school leaving age should never have been increased from 15 to 16. In his view it introduced a cohort of disaffected adolescents who would have done better learning a trade. Maybe that’s the answer to the problem you have correctly identified of the hard-working pupils being held back by the behaviour of a minority of disinterested children. I also believe that parents have a much stronger role to play in solving the problem which seems much less prevalent here in Ireland where there is a great deal of parental and peer pressure on young people to go all the way in full time education. Parents – ah now, that’s another problem altogether. The teacher tries to discipline the badly behaved children, only to find they are verbally or physically assaulted by the parents, who themselves are possibly just as badly behaved as their offspring. There is too much of a laissez-faire attitude to discipline in state schools. What happened to technical schools? My childhood house was pulled down to make way for a technical school. Do they not exist now either? Yes you’re right in that disaffected teens might thrive in such schools, but this poses another question….where are the apprenticeships nowadays for them to take up and feel productive members of society? Neither of my boys wanted to go to university, but both were lucky enough to gain apprenticeships that earn them a good living wage. I became an Engineer via the apprenticeship route and part-time study. My son entered nursing, again, via the traditional route – on the job training in a mental hospital with part-time study. It seems that, these days, whilst part-time study options are available, nursing requires a degree qualification.